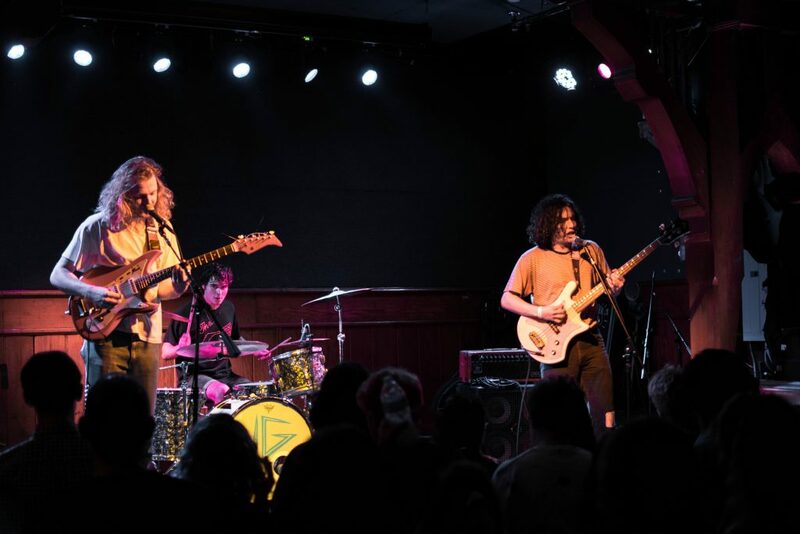 The Seattle based rock trio Naked Giants made their first ever Chicago appearance on Saturday, May 5, at Schubas Tavern. 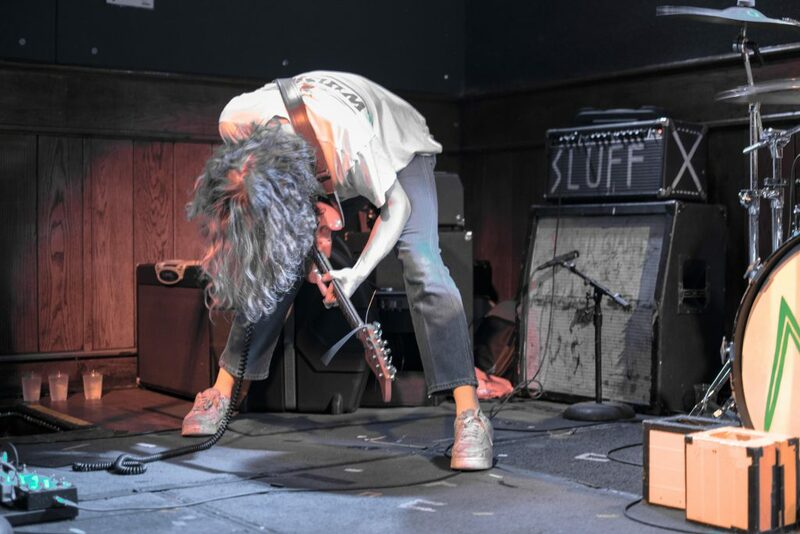 Back on the West Coast, the band has made waves since 2015 when they came in as runner up in Soundoff, the Pacific Northwest’s largest under 21 battle of the bands. The group started playing together while they were still in high school and has been producing their own unique blend of garage punk, classic rock, R&B, and power pop ever since. With the incredible musical talent and commanding stage presence of this group, it’s easy to forget how young they are—so young in fact that WNUR DJ Anna White recalls befriending the “goofy” group while playing with her own band at Soundoff during her senior year of high school. Since then, the band has released an EP and a full-length album under New West Records, as well as played at Timber Music Festival in Washington and South by Southwest in Austin. After completing their own US tour this spring, the band will tour with Car Seat Headrest across the US and Europe. The band wasted no time in demonstrating their versatile musicality, opening with bassist Gianni Aiello and guitarist Grant Mullen playing with distortion and loop pedals while drummer Henry LaVallee laid down an energetic rhythm which helped the band seamlessly transition into their catchy first song. The band’s appreciation for punk shone through here, with fast, heavy strumming and flat, aggressive vocals. They then played one of the most popular songs off their new album, “TV,” after a brief pause to correct some technical difficulties. Aiello used this time to address the crowd, seemingly in disbelief that their music had travelled far enough to pack Schuba’s Tavern in Chicago. It struck me how adorably awkward he was. Next to me, Anna was laughing. Her word, “goofy,” was the best way to describe the atmosphere of the show. The music was fun on its own, but the guys were simply funny to watch. They obviously loved what they did and had great chemistry together, dancing around on stage and interacting with one another both physically and musically. Even the guitars complimented each other with inverse red and white coloring on the body and pick guards. 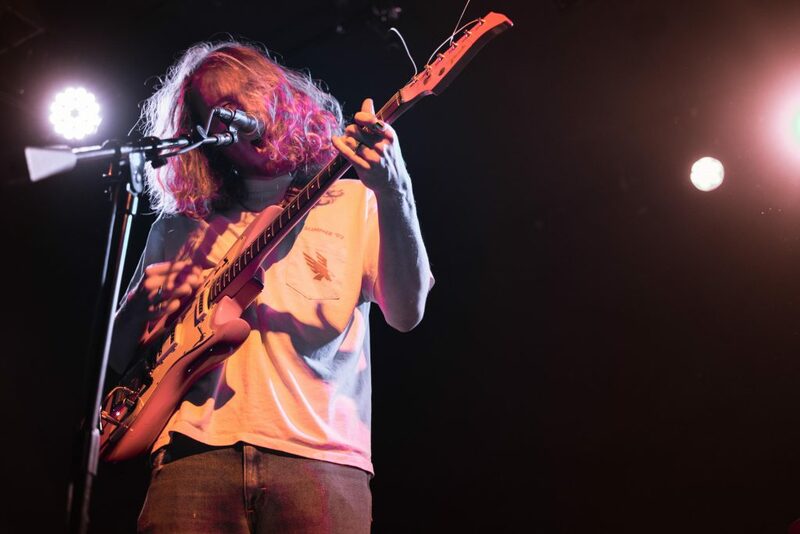 They picked back up with “TV,” taking a humorous tone and proving once again the versatility by playing solos and layering sounds on top of the already fun song. Aiello even threw his bass behind his head for a mid-song solo, all without missing a beat. The next song, “Everybody Thinks They Know,” turned this energy back onto the crowd, using a call and response in the chorus that got everyone dancing and singing to the pop groove. Not a single song sounded like a regurgitation of their studio cuts. Every song had solos, breaks, experimental change ups, and, of course, theatrical performances from the band members themselves, with both Mullen and Aiello flying around the entire stage (and floor) and LaVallee twirling his sticks and flicking sweat off his brow and onto his drums. There was never a lull in the energy of the show from either the crowd or the band. Even when the band slowed down with a more blues inspired piece, “Slow Dance II,” the joint guitar-bass improv in the middle of the song kept the mood lively, adding a very “goofy’ twist with Aiello and Mullen facing each other in center stage and Aiello giving a playful tug on Mullen’s whammy bar. 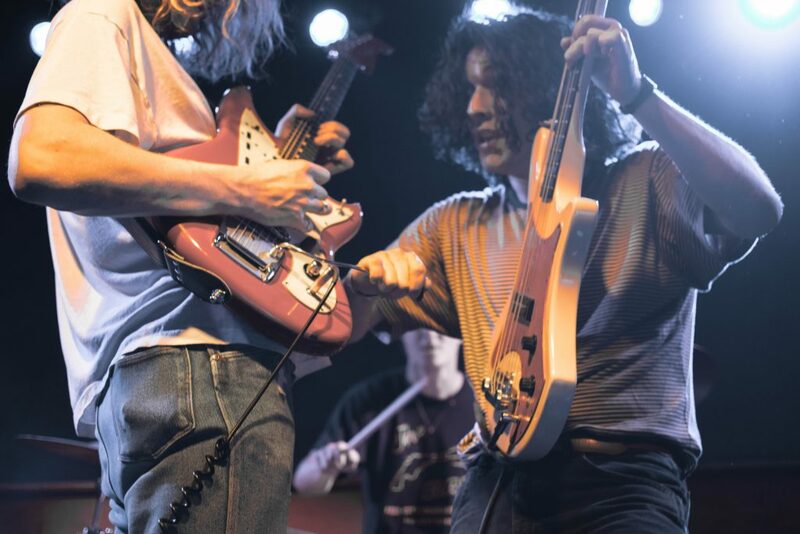 They didn’t pause to talk to the crowd very often, preferring to let their songs flow together using their common garage rock elements as a bridge between different melodies. The show’s climax came with an incredible drum solo from LaVallee, who played what seemed like an entire song on his own. He was so far into his zone that he stumbled into the back wall, exasperated, on his way to center stage for a victory lap. The show didn’t end there—the band played one final song called “Ya Ya,” one of their oldest, and again invited the crowd to participate with hand clapping and call and response. The show ended with a bang, with the guys dancing, jumping, doing tricks, and truly just having fun with each other. Their energy was infectious, and everyone left that night with a smile on their face. When the Naked Giants come back in September on their tour with Car Seat Headrest, they will definitely have a fan base waiting for them.